Not only is Oxford home to the renowned university, it has been the home of well-known authors such as JR Tolkein, C.S. Lewis and Lewis Caroll. 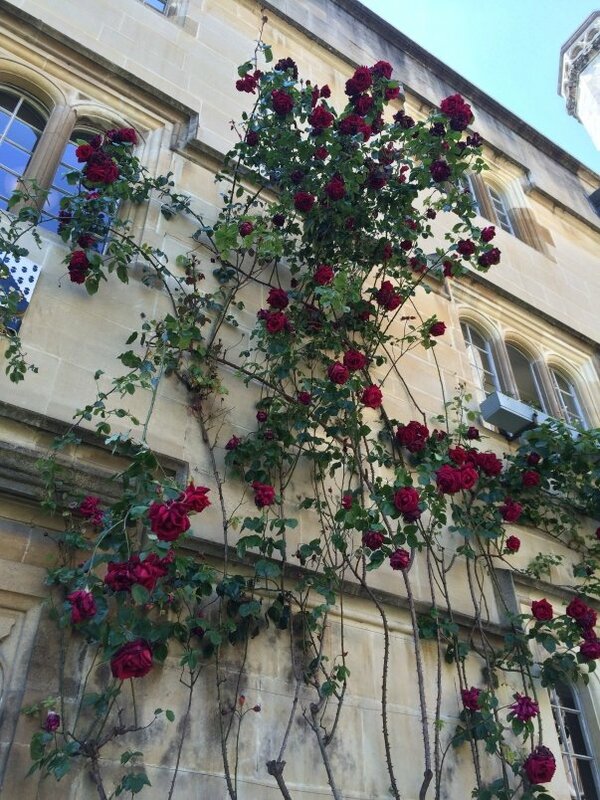 And while walking amongst the beautiful buildings and gardens that make up central Oxford, it’s not hard to imagine where at least some of their inspiration came from. The University has had many famous attendees including, Bill Clinton, Professor Stephen Hawking, T.S. Eliot, Hugh Grant, and many others. You can find a more complete list here. 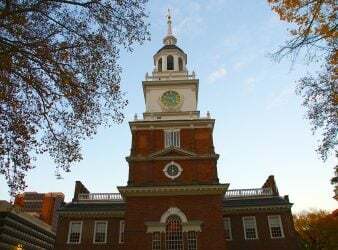 The best way to get yourself acclimated is to do a walking tour. We set one up with a local tour guide. We ended up being the only ones to sign up for our time slot, so we got a private tour! Peter was a perfect choice as we had our ten year old with us and Peter is really good with kids. 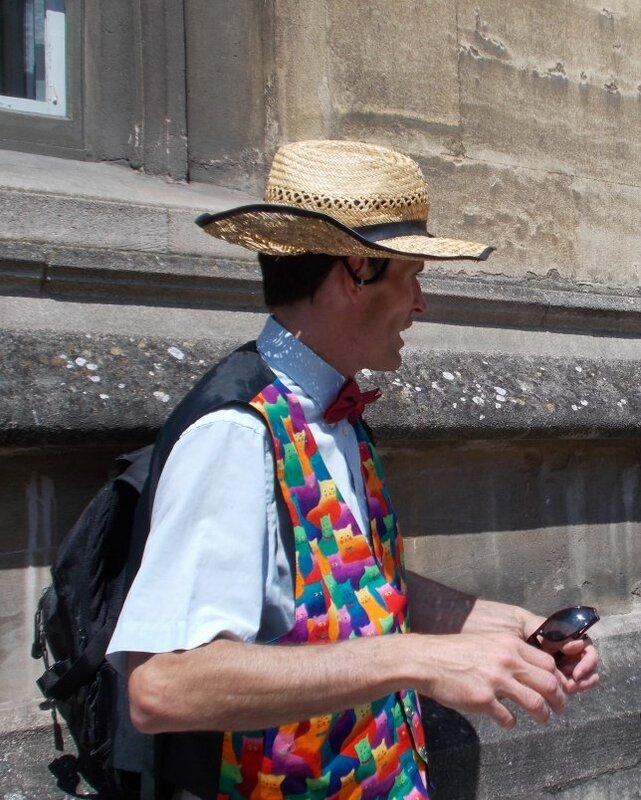 I found him at oxfordtimetours.co.uk and read about how he leads the tour as if he is a time traveler who has been to the various colleges that make up Oxford University from the time they began. 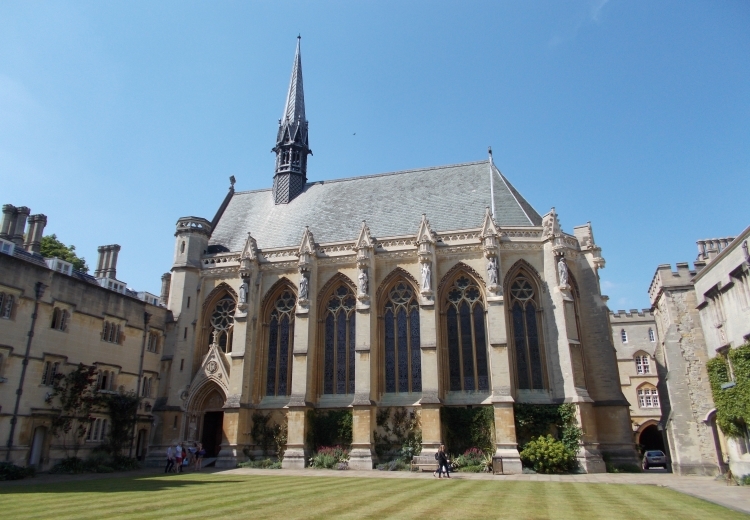 The oldest of Oxford’s colleges are University College, Balliol, and Merton, established between 1249 and 1264, although there is some dispute over the exact order and precisely when each began teaching. Our time traveling guide was knowledgeable, funny and kept our ten year old engaged in the conversation. We highly recommend looking him up when coming to Oxford. You will stroll through the various colleges and peek into their central courtyards. There are 38 different colleges that make up Oxford University (no, we did not visit all of them). It’s very interesting to hear about the history of the town and how the townspeople and university folks fought for years. Peter was a very good storyteller. 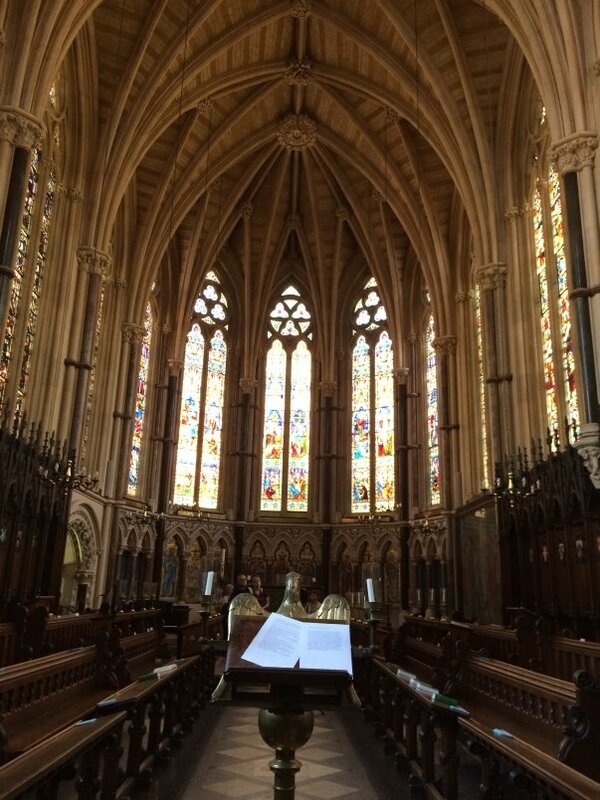 The colleges are stunning. While we were on our tour there were sections closed as it was final exam time. Also, there were remnants of celebration strewn in the streets from a custom known as Trashing in which the graduates celebrate by throwing confetti all over each other. 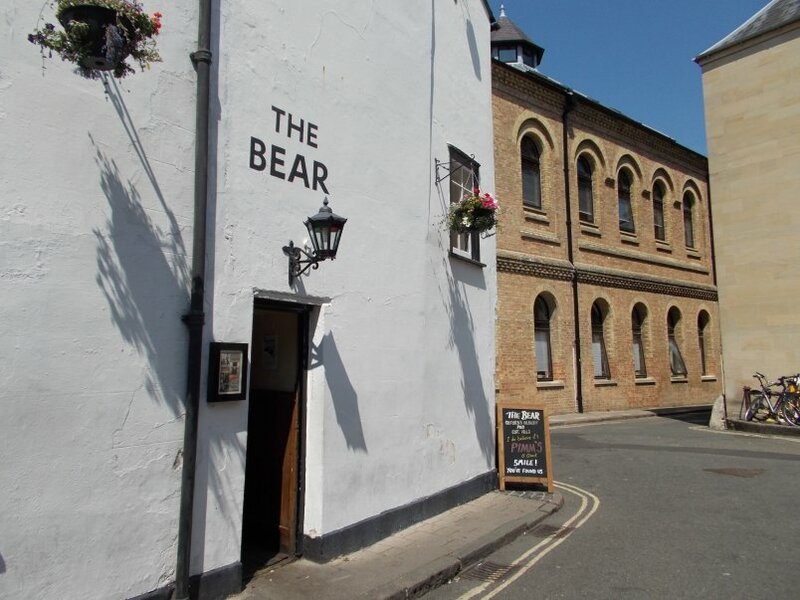 While on the tour you will also pass a pub called The Bear, which is reported to be the oldest in Oxford, though that fact is disputed by some. We walked in and found my husband’s head nearly touched the ceiling! It’s very compact and cozy. Well worth a look. 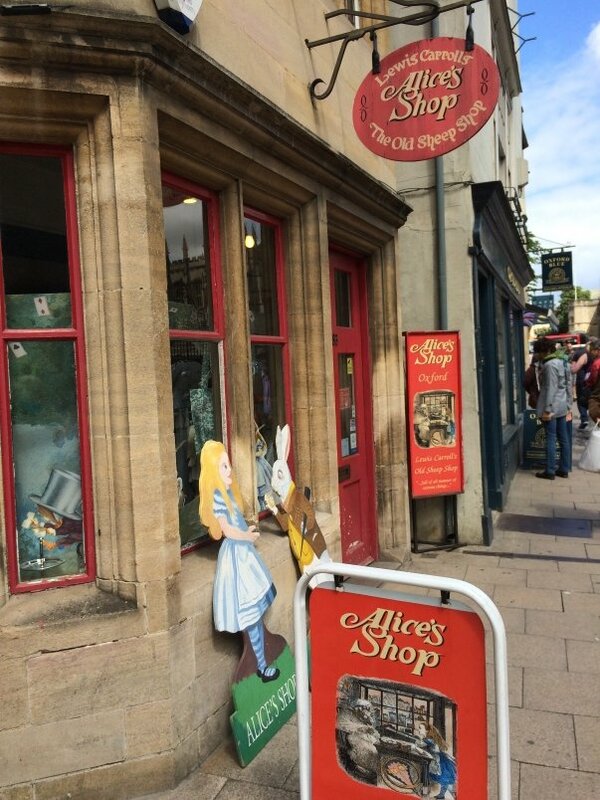 Also note, that when you arrive at Christchurch College, across the street is the famous store, Alice’s Shop. It’s very small and simply a must see if you are at all into Alice in Wonderland. The author of the Alice stories was Lewis Caroll. He attended Christchurch College, where he befriended the dean, Henry George Liddell, Alice’s father. Caroll would regale Alice and her siblings with the stories of Alice in Wonderland and she begged him to write them down. Apparently, he was reluctant to do so because he didn’t want to be known as a children’s book author. Many people are very happy he did! By the 1930’s it was one of the most popular children’s books in the world. Alice’s Shop is the location of the store where Alice used to go to buy sweets. It is now filled with Alice in Wonderland memorabilia of all sorts. 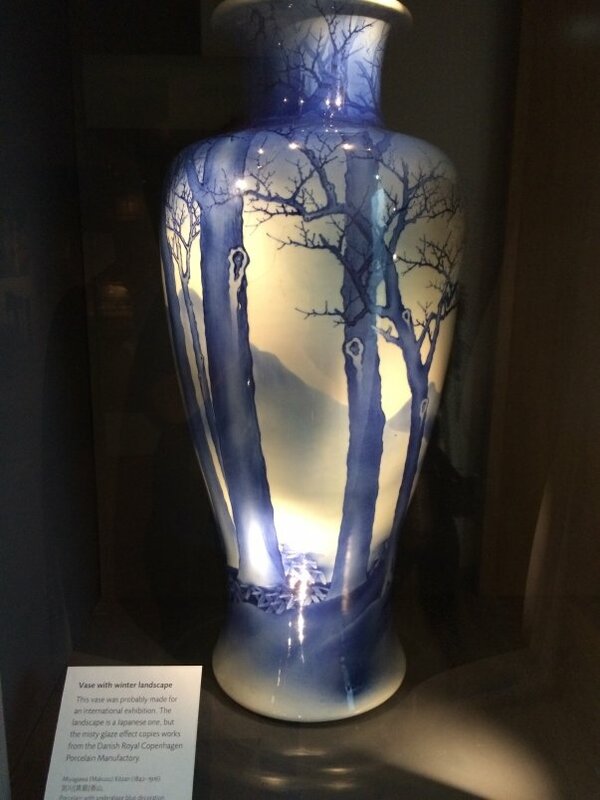 Click here for more info on Lewis Caroll. 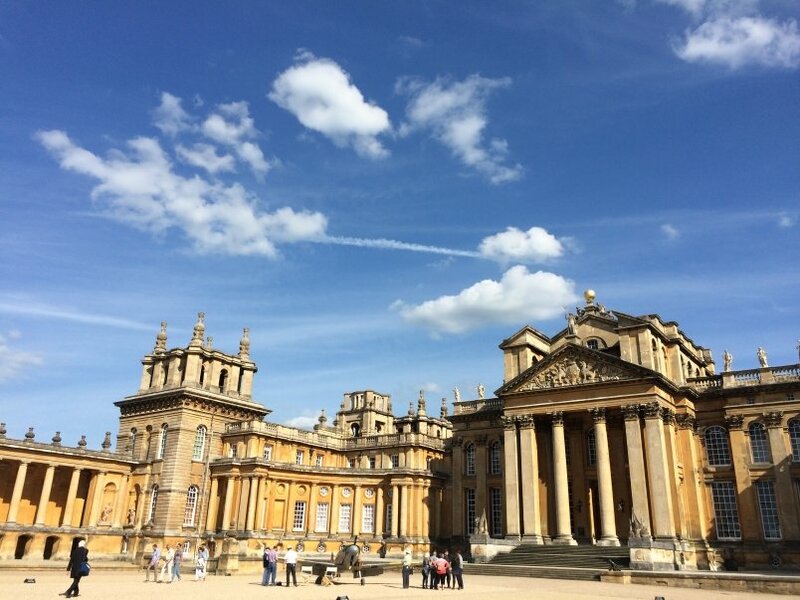 Another must see is Blenheim Palace. 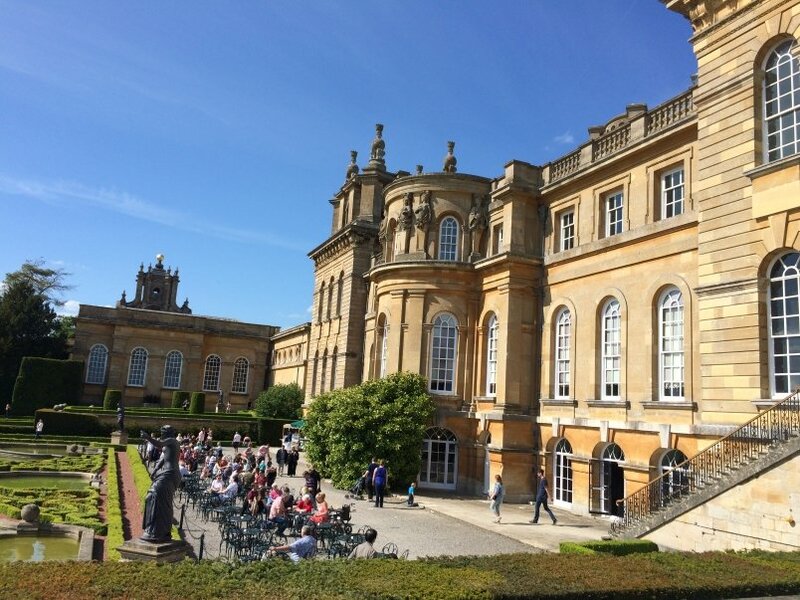 It’s about a twenty minute bus ride from the center of Oxford and is best known for being the birthplace of Winston Churchill, though its history is much more extensive than that. Back in Oxford center there are a number of really good museums. And the added bonus is they are FREE. 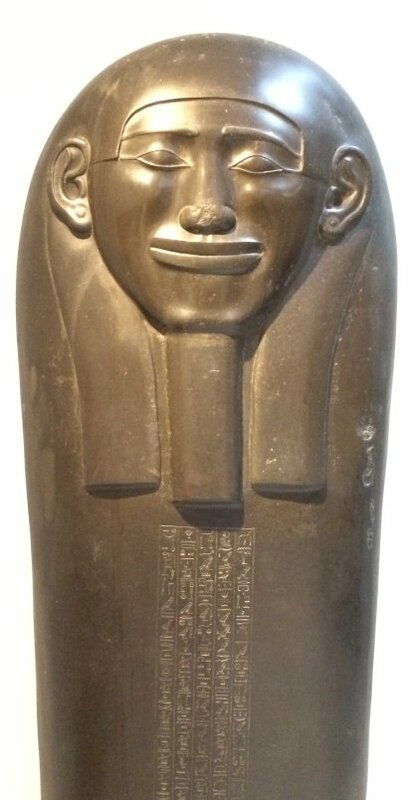 Among the best are The Ashmolean Museum of Art and Archaeology, The Pitt Rivers Museum and the University Museum of Natural History. 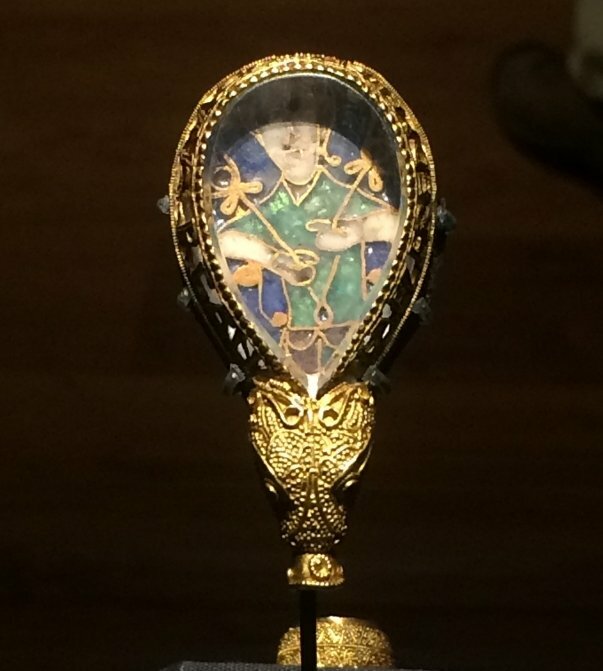 Though it’s not a museum, one should definitely not miss The Bodleian Library. It is amazing! It’s the main research library of the University of Oxford and one of the oldest libraries in Europe. Not only that, it has over 11 million items! 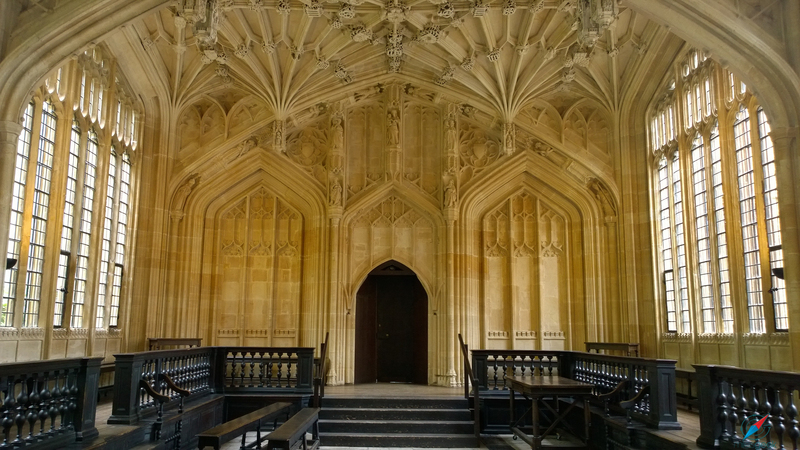 And if you’re a Harry Potter fan as we are, the added bonus to visiting the Bodleian is The Divinity School. They actually filmed scenes for Harry Potter and the Philosopher’s Stone here! The incredible room served as the infirmary at Hogwarts. 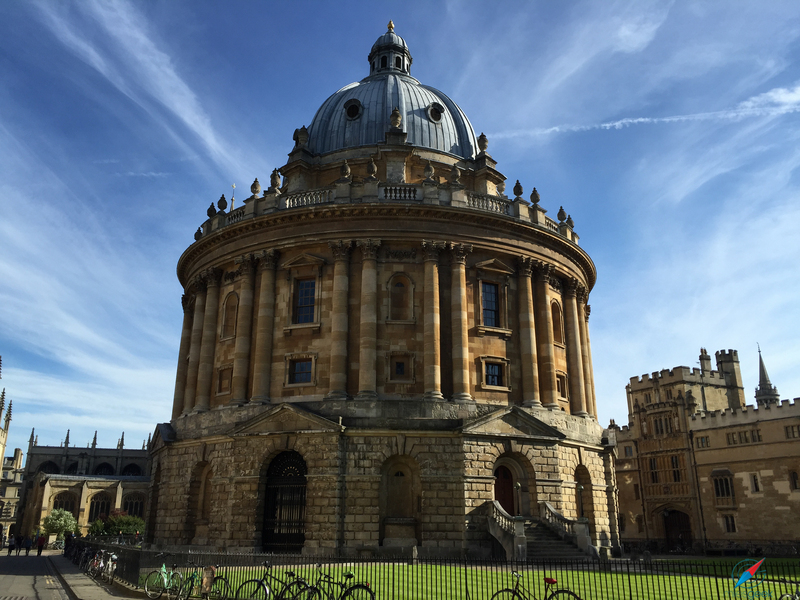 For a more extensive tour of various Harry Potter sites around Oxford, check out The Harry Potter Trail! 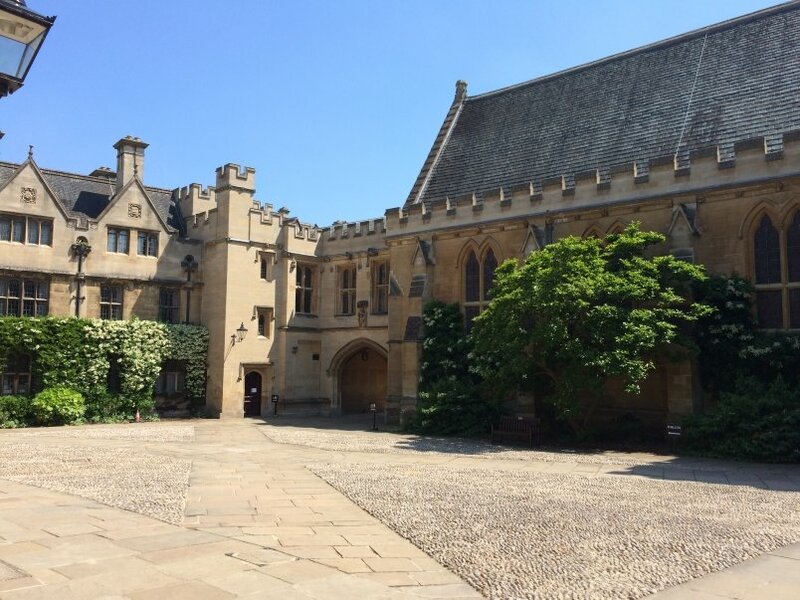 The Divinity School is a medieval building and room and was built between 1427 and 1483. It is the oldest surviving purpose-built building for university use. Other than serving as a spectacular space for movie sets, it’s currently used for lectures, oral exams and discussions on theology. The ceiling consists of very elaborate lierne vaulting with bosses, designed by William Orchard in the 1480s. 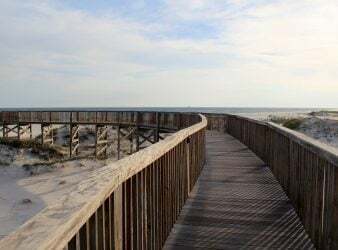 It is truly a marvel and well worth a visit. One afternoon we decided to get out on the water. 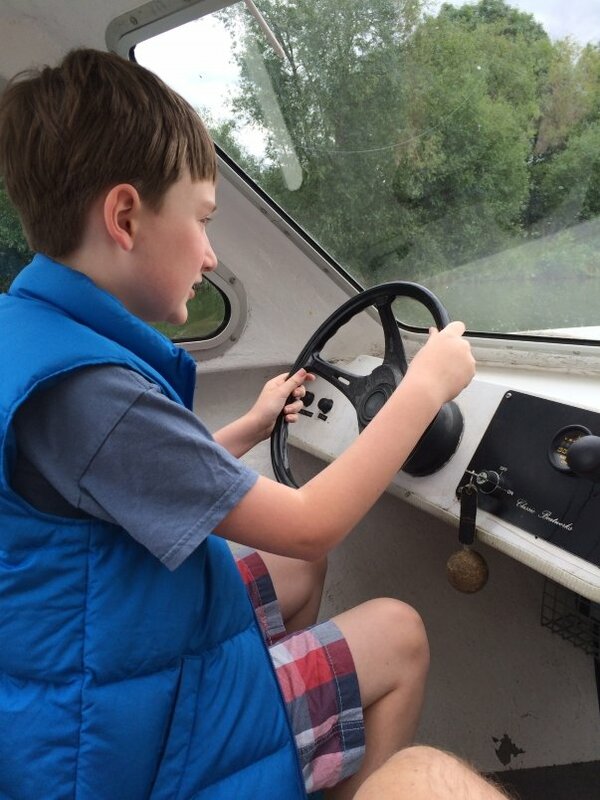 We found the outfit, Salters Boat Hire, right next to Folly Bridge on the River Thames here in Oxford. 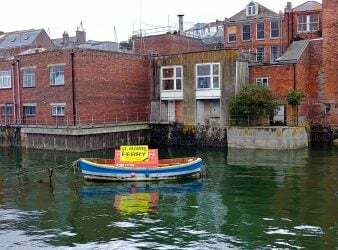 They rent punts, skiffs, electric launches and day boats. My husband didn’t want to do any manual labor, so we opted for a motor boat. And what luck! 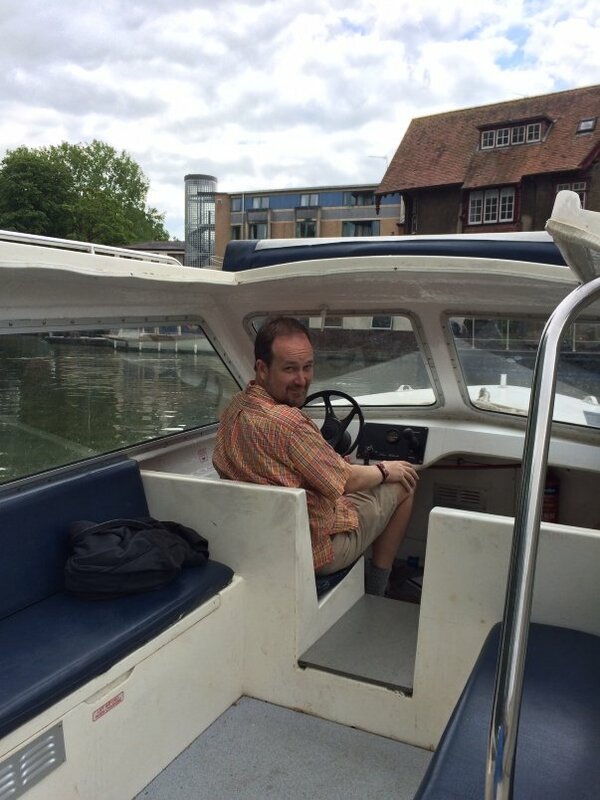 The one we wanted wasn’t available at the time, so they let us take the larger one which was electric (better for the environment and quieter) for the price of the smaller motor boat. We headed down past Christchurch meadows and found ourselves floating by houseboats, geese and weeping willows. It was very relaxing. We had a pair of swans swim up to the boat and saw several groups of baby ducklings paddling along. It was lovely. We only wish we could have gone further! We stopped at the Iffley Lock. To be clear, you are allowed to continue through the locks, but we’d only paid for a one hour rental. It was 45 pounds for the hour. 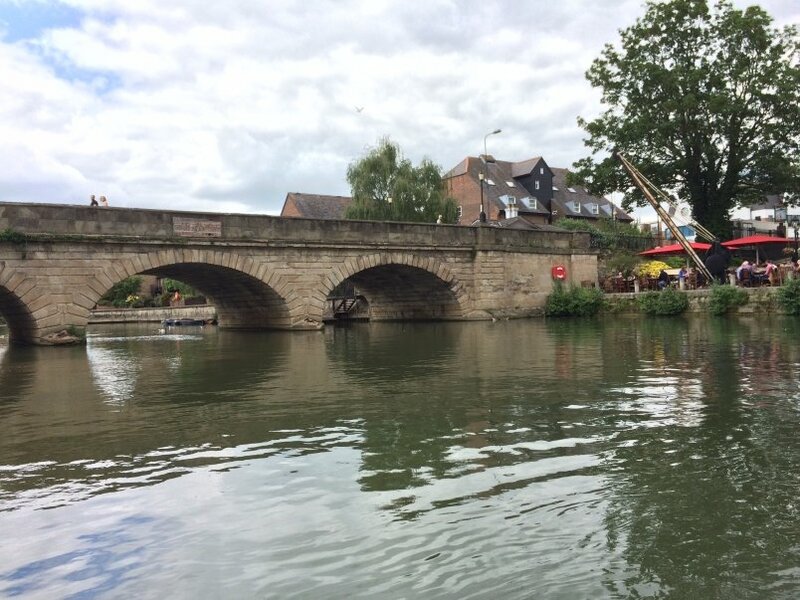 If you’re interested in a row boat (skiff) or a punt it’s 20 pounds an hour, with the chauffeured punts running 60 pounds an hour and the new pedal punts 25 an hour. You can also rent for longer times, and the hourly price decreases if you do. Also, you would then have time to go through the locks. The guy who rented us the boat said that there is usually someone standing by to operate the locks, but if they aren’t there, there are instructions and apparently it’s not very hard, though we cannot speak from experience. 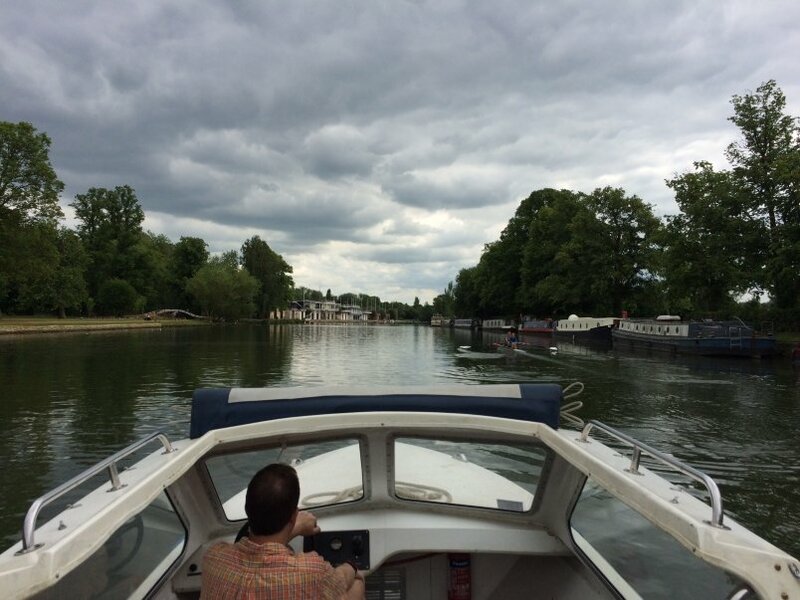 Salters Boat Hire is open every day from April to September from 10am-6pm. 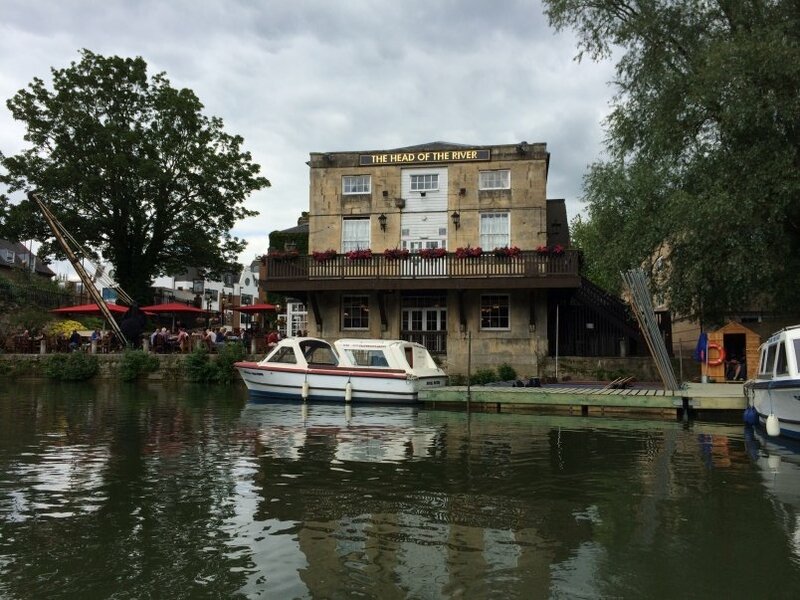 The folks working there were very friendly and we can happily recommend them if you’re looking for a bit of a boating experience in Oxford. 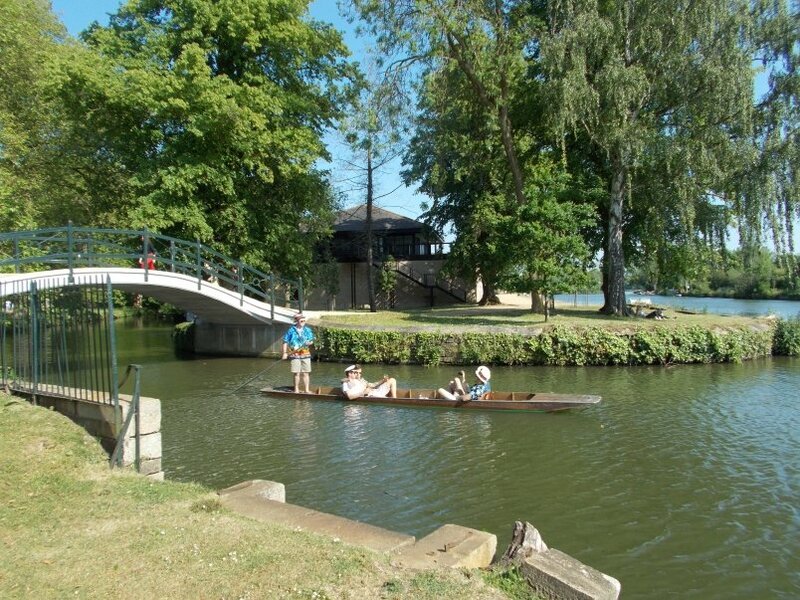 If you are not into boating, there are well groomed walking paths through Oxford University Parks and along the River Cherwell. 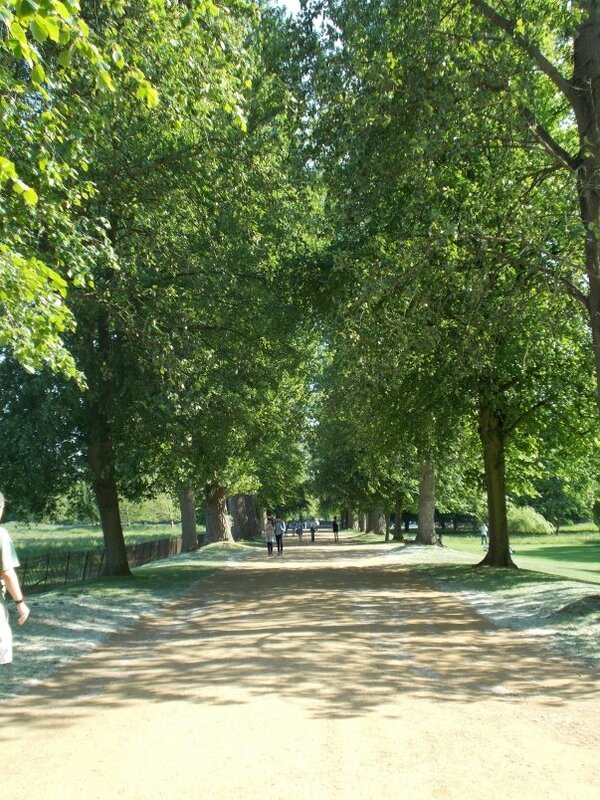 The park area provides many quiet spots to picnic or read, with views of the colleges in the distance. A trip to Oxford wouldn’t be complete without stopping in somewhere for afternoon tea. In the English tradition you are served a pot of tea with scones (much nicer than the typical ones found back in the US) preserves and clotted cream. Not only will you be taking part in tradition, but it’s a tasty treat! Our suggestion would be the Vault Cafe. 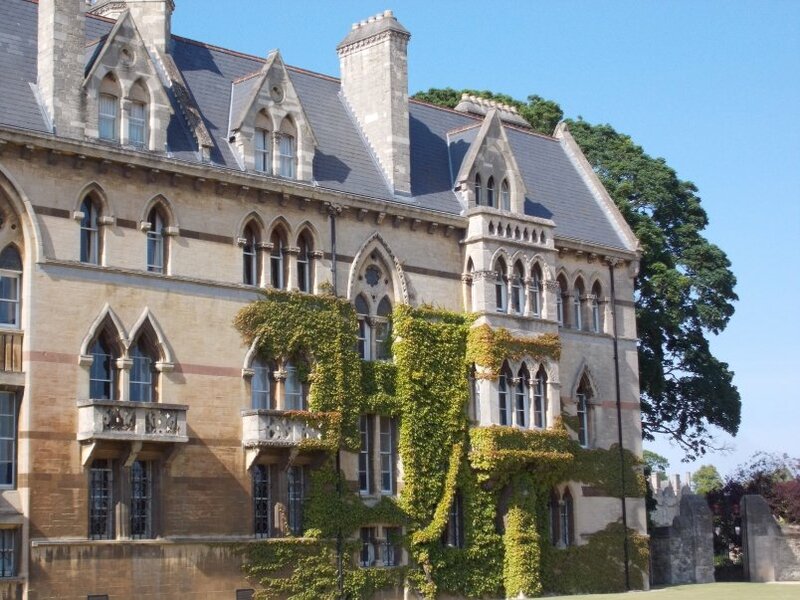 It is housed in Oxford University’s Old Congregation House of 1320, a very cool atmosphere indeed. 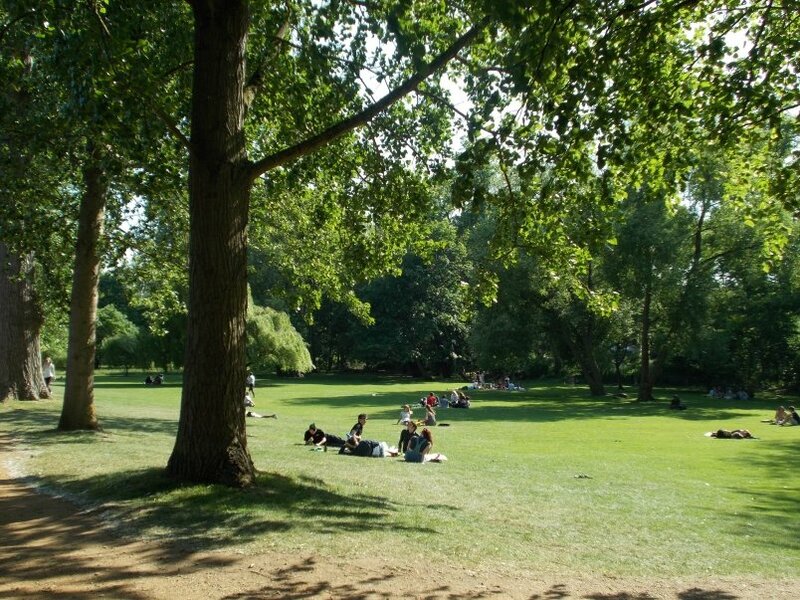 If the weather is nice, there is a garden outside that you can sit in. It is surrounded by architectural treasures, flowers and aromatic herbs. Their website says that, during the winter months, hot water bottles & blankets are provided. For more info you can go to their website. Enjoy your time in Oxford and happy travels!